Pet Du Jour! : Grace & Family needs your help! DEB--If I had any family or friends in Houston, I'd be on the phone! From this distance, all I can offer are lots of purrs for your selflessness, and all good wishes for happy "forever homes" for Grace and her mob. GS--Will you please slow down and get better!! At least you found your glasses. I can't find mine unless I have them on(LOL)...so I have to be very careful where I put them. ML--Days late--HAPPY BIRTHDAY!! Get better soon. Purrs and kitty-hugs from my gang, and a big sloppy one from Shep the Dog! I second the kudos to Deb an GS! I too would take them but am too far away. I know with this much publicity there are bound to find an awesome home very soon. 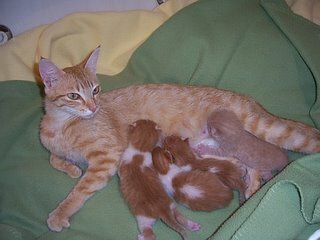 I think it is wonderful to help this mother and babies. By my daughter's condo there are currently two litters of beautiful babies amounting to around 13 kittens and I know how hard she and some neighbors are trying to rescue those. You, GS, and Deb are wonderful people and I hope these beautiful babies and mom will soon find homes. Deb, I think you're the hero. Well, GS too, she does so much for animal causes! But you took in this kitty family, commiting yourself to the task ahead. Like Mumma said, if I lived closed, I would help all I could. You're thought of and prayed for from Arkansas. You're doing a great job, God bless you! I love this little family and hope they find their forever homes soon. Claire - where is your daughter's condo? I don't know where you're from. If you're anywhere near Los Angeles, I could refer you to some groups I know. 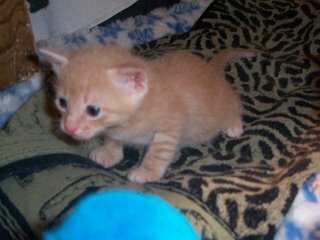 For anyone who needs to advertise kitten who need good homes, you could try www.petfinder.com - it's nationwide and they offer a free classified section where you can place an ad for 14 days. Scroll down a little and look for "classifieds" on the left. Lots of rescue groups are linked to that site too. It's so sad the problem of too many kittens! If people would just get their pets fixed, there would be...no unwanted kittens! There are so many sad stories nationwide. My Benji came from a colony of around 20+ ferrals. He was one of 8 kittens we were able to catch! There were probably at least 8 more we weren't able to catch! We set traps with no luck. It's a vicious(sp?) cycle in these "colonies"! And just down the street a friend of mine (another foster) feeds a another colony. Luckily, she has been able to catch many of the adults and spay/neuter them. Sad, really. There are too many ways of getting your pets fixed cheaper. You sure are right Deb when you say Grace and family are photogenic. They all are so cute. Looks like Grace is a bit on the thin side?? Anyhow God Bless you Deb for what you are doing and prayers are still going up for this sweet group. Grace does look thin! However, this little Mommy can eat. She goes through ten to twelve cans of Fancy Feast a day. She is in perfect health, just has a "svelte" figure! All that nursing I guess. The babies are almost six weeks old and I will start weaning them soon. Maybe Grace will put on some weight then! Thanks to everyone for their prayers and comments! We've been busy all day with Charley's nurses and therapists. Nothing wrong with him, just standard re-evaluations. I'm feeling much better, thank you all. Don't forget there wouldn't have been any of this if KAREN C had not noticed Deb's comment on TDK. Wow, what that started! It is so amazing what we can all do together. I have faxed several local vets, passed out flyers in the neighborhood, the computer club has the photos posted downtown, and I offered each nurse a free kitty today! Also emailed folks out of Houston within a few hundred miles. One nurse and her sister each want a kitten, they haven't gotten back to finalize, it's been so hectic today. Hopefully when all is done there will be more homes offered than kittens. I'll be offline the rest of the day. Just be glad when those babies and their momma have forever homes. See you all later...! Great News -- One of my neighbors is a manager for PetSmart. She is working around the clock to open a new store here in Houston. Finally got in touch with her, she will be off Saturday and come over with a list of resources and rescue agencies in the area that she trusts. She said it shouldn't take long to find them homes, as they are so cute and healthy. And it is a holiday weekend. Thanks for answering my question Deb. Guess Grace is eating for five, hence the reason for eating so many cans of food. So glad they are all healthy. Also so glad that everyone is really doing so much for these little ones. If the kitties could know how much is being done for them, they would be so proud of all of you, especially you Deb. God Bless all. Oh by the way GS, I don't think anyone cares how many pictures you put on here of these cuties. We sure do like to seeing them. Wonderful news Mary Lynn! Do you think the nurse would want to take Grace AND a kitten? And how great to have a PetSmart connection! She hasn't mentioned which ones (!) she wants, but she and her sister each want one. I hope they come through. She's supposed to let me know tomorrow. 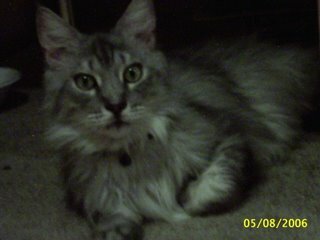 I had emailed a friend near the Piney Woods, she has a few acres, she emailed back and said they are overrun with ferals. If people could just see them...! Good Morning Everyone! I'm very excited that ML's nurse and the nurse's sister might want one of my kitties. The PetSmart connection is wonderful. The babies are getting more cute by the day. Wrestling each other! Too cute! Grace deserves a great "forever home" for all the work that she has done taking care of her babies! No absolute "yes" yet in connection with adopting the kitties, but with all this attention (THANK YOU EVERYONE) hopefully something will work out! I'm Claire's daughter. My condo is outside of Detroit (Farmington Hills). The kittens are darling and i was told by a neighbor that the current batch is going to be adopted by a few neighbors in the area. I also have a coworker here at work that worked for the Michigan Human Society. She told me about a program they run for ferals. To sterlize them for free or low cost, so we can return them to their home. Grace and her babies are darling. Grace is very elegant! Holly - that's great to hear that you have that program for ferals there. Aren't there a couple pretty big rescue groups up in your area too? I think I've seen ads for donations. We have the trap/fix/release programs here in Los Angeles, but I guess some places don't. I'm glad the neighbors are helping with homes. I hate to hear about homeless kitties. Hi-- I posted some info on Laurence Simon's Catcall blog that might be useful in getting mom and babies adopted. Hope it helps!